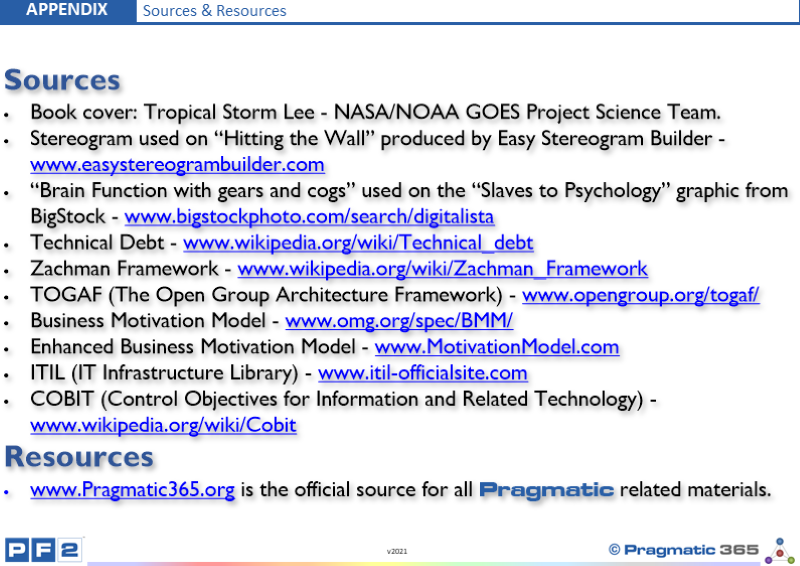 Here is listed various sources and references to things referred to in the Pragmatic Frameworks. You can always access the most up to date material online at www.PragmaticEA.com. The Pragmatic Lifeguard story is adapted from a well-known parable used in the healthcare industry, brought to the authors attention by Barbara Hill (Elyon Strategies). Its original source is unknown although it is referenced in “The Upstream Doctors” by Rishi Manchanda who said he first heard it from Adewale Troutman - Head of the Health Department in Louisville, KY and now president of the American Public Health Association.